Jersey forward Pierce Phillips says the club is aiming to win their British and Irish Cup pool and secure a home quarter-final tie. The island side must earn a win at pool leaders Doncaster to ensure they make the knockout stages for the first time in club history. "We want to win the group, we know how important it is to play in front of our home fans," Phillips told BBC Jersey. "It'll be a massive thing for the club if we get to a home quarter-final." 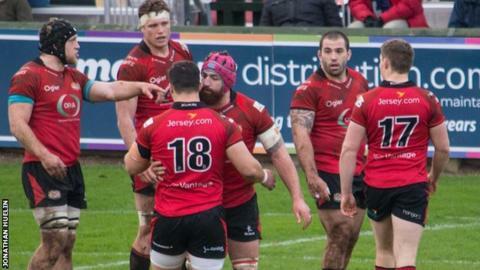 Phillips captained Jersey as they beat Dragons Premiership Select 24-12 at St Peter on Saturday to keep them in the hunt for a place in the final eight. "We don't want to leave things to chance by coming second and potentially going through as a best runner-up," Phillips added.